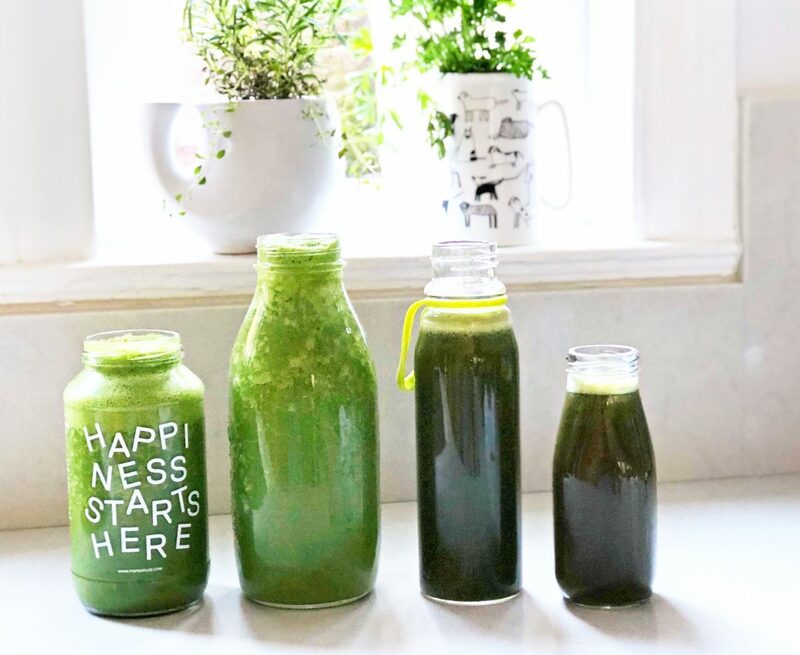 I decided to create this DIY Detox Juice & Smoothie Cleanse blog (and video), because I wanted to show you how easy it is to create a DIY detox cleanse at home. The words “detox” and “cleanse” are ubiquitous in today’s culture. And these words are very often misused. While I believe there’s an important place for both detox juices and smoothies in your life, neither are miracle cures. Moreover, a juice or smoothie cannot “detox” or “cleanse” your body in of itself. However, both can support your organs of detoxification. This is a key distinction. You body naturally detoxes on a daily basis. Your liver, kidneys, lymphatic system, and skin, are all involved in this process. But we live on a polluted planet. And as we age, our organs of detoxification don’t work as efficiently. This is why I created a FREE Overnight Detox Blueprint for you. There are plenty of easy actions that you can take to support your body today. Follow these tips along with your DIY Detox Juice & Smoothie Cleanse. I like both juices and smoothies for your DIY Detox Juice & Smoothie cleanse. However, if I had to choose between the two, I’d choose smoothies over juices. This is because they contain fiber, whereas as juices do not. Fiber is one of the most important “detox” foods. It acts like a broom and sweeps debris out of your digestive tract. Remember, that excess estrogen will bind to this fiber and thus be eliminated. I cannot stress the importance of fiber. This is one of the reasons why I’m no a big fan of a juice cleanse. A lot of juice bars offer a cleanse or detox bundle seasonally, but it doesn’t make sense to me. I include juices in my DIY Detox Juice & Smoothie cleanse because specific fruits/veggies are better juiced: Fibrous veggies such as beets, celery and fennel, are better juiced than blended. A small percentage of people cannot tolerate too much fiber. Certain digestive issues could flare up if too much is introduced quickly. In this case, juices might be easier to digest. However, make sure that your juice is predominantly made from veggies as opposed to fruit. This is because you don’t want too much sugar in your juice. Keep in mind that you don’t need to worry so much about fruits in smoothies because the fiber will blunt the blood sugar spike. I love my Omega Juicer because it keeps it allows my juices to be cold-pressed. This is important in extending shelf-life, and keeping those enzymes alive. This juicer also makes great nut butter! I use my NutriBullet when I’m making a single-serving smoothie. I use my Vitamix when making my smoothies ahead of time. It’s one of the best investments I’ve ever made! These are the best glass storage bottles for both smoothies and juices, that I’ve ever used. Place all the ingredients in the 64-ounce carriage of a high-speed blender. Add filtered water up to the 3/4 mark. Blend well. You can store in the fridge for up to 2 days. Shake well before consuming. Or you can add some crushed ice and re-blend. I add ground flaxseed to a smoothie just before drinking. If you add it hours or days before drinking, it makes you smoothie a bit to gloopy! Swiss chard and/or Dandelion greens, fennel, celery, pear, ginger, and lemon.